Visitors to this blog, and our other blog, are well aware the Copenhagen is the world's cycling capital. 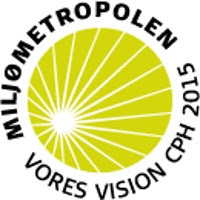 The City of Copenhagen has recently launched a campaign with the goal of making Copenhagen an unrivalled 'eco-metropole' by the year 2015. Here's their website, in English. While our bike culture is, by and large, up and running, there are improvements to be made. There are in all four areas of focus if Copenhagen is to become the most environmentally friendly city in the world over the next 7 years. It's an interesting and exciting campaign. Living in Copenhagen, you are well aware of environmental issues. In my backyard, for starters, there are garbage containers for household garbage as well as separate containers for batteries, glass, metal, plastic, newspapers and last but not least, cardboard. At the head of the harbour there is a long row of off-shore wind turbines that signal Denmark's role as the world's leading producer of wind technology as well as the world's leading user of wind energy. This row of 20-odd turbines provide Copenhagen with 3-5% of her energy. 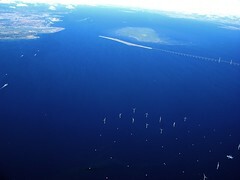 Further south down the Straight between Sweden and Denmark, there is a massive off-shore wind farm under construction. Swedish-owned but the power will be flowing to both countries. There's a lot of hype here about Copenhagen hosting the next major climate summit in 2009. The Kyoto Agreement will be replaced by the Copenhagen Agreement. If they all agree, of course... and so the city is working towards branding itself as this Eco-Metropole. It would be fantastic if they pull it off. tags: "bike politics", "environmental issues"